Roller End Bearings – BNB Industries, Inc.
BNB Industries, Inc. manufactures Blind Bore Bearings, Thru Bore and Extended Pin Bearings to solve maintenance and design problems. While our standard bearing material is our Premium Ultra-High quality UHMW-PE material, we also manufacture our bearings out of several other materials for use in a variety of applications and operating environments to meet your specific application. Our bearings are a superior alternative to ball bearings for use in a wet or wash down environment of a processing floor or the filling line of a corrosive or chemical conveyor application. Unlike standard ball bearings that are likely to rust or become corroded our bearings are unaffected by heavy wash down or product spillage. With the use of the proper material for your application these bearings supply superior maintenance free service for your environment. Blind Bore Bearing: Our standard Blind Bore Bearings when used with our Ball Screws offer a sanitary type roller for use in gravity rollers, idler rollers or belt return rollers. Blind bore bearings are designed to be used in an application where there is not a constant load or pressure applied to the roller. Thru Bore Bearing: Our standard Thru Bore Bearings are manufactured in three standard lengths for light, medium or heavy duty applications. 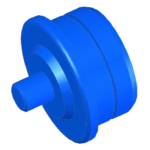 Thru Bore Bearings are designed for use in gravity rollers and idler rollers used in powered rollers. 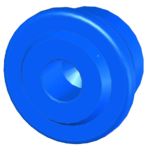 Extended Pin Bearing: Our standard Extended Pin Bearings are designed for use in gravity rollers, Belt return rollers and carrying rollers used in belt driven live roller conveyors. Ball Screws: Our self-aligning ball screw shaft or axle assemblies are designed to eliminate the rollers from binding in the frames due to misalignment of the roller to the axle, this condition is most often caused by bent frames, or warped tubing. The round ball type shaft also provides less co-efficient of friction so the roller turns easier, and reduces heat build up due to friction caused by the misalignment of the shaft in the bore of the bearing. 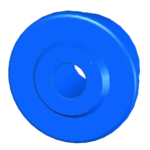 Hex Shaft Adapters: The adapters are slipped over hex shafting to provide a smooth and round journal surface for the Thru Bore bearings to roll on.